You'll explore and learn at Acropolis Museum and Technohoros Art Gallery. 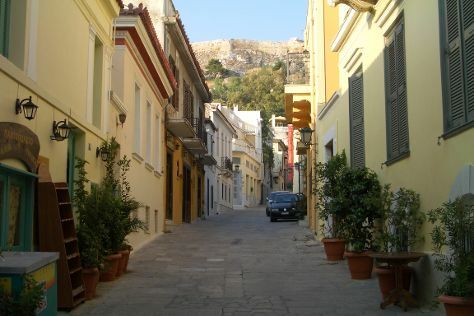 Plaka and Areopagus are good opportunities to explore the local culture. Explore the numerous day-trip ideas around Athens: Sea Turtle Rescue Centre (in Glyfada), Donkey's Land (in Koropi) and Panagia Faneromeni (in Vouliagmeni). On the 30th (Sat), spend a cool day on the water with Ikarian Cruises. Next up on the itinerary: delve into the distant past at Acropolis of Athens, take a stroll through Ermou Street, get interesting insight from Tours, and choose your vessel at Greek Isles Yachting. Take the guesswork out of planning a Athens vacation by using our trip itinerary maker. If you are flying in from United States, the closest major airport is Eleftherios Venizelos International Airport. Expect a daytime high around 63°F in March, and nighttime lows around 50°F. Wrap up your sightseeing on the 3rd (Wed) early enough to travel to Aegina. Aegina is one of the Saronic Islands of Greece in the Saronic Gulf, 27km from Athens. You've now added Church Saint Nicholas the Thalassinos to your itinerary. On the 4th (Thu), take in the architecture and atmosphere at Agios Minas Monastery, kick back and relax at Moni Island Beach, and then pause for some serene contemplation at Church Saint Nicholas the Thalassinos. Here are some ideas for day two: take an in-depth tour of Historical & Folklore Museum of Aegina, stop by Iliachtina Arts - Crafts, explore the world behind art at Musee Christos Capralos, then kick back and relax at Marathonas beach, and finally contemplate the long history of Temple of Aphaia. To find where to stay, photos, other places to visit, and other tourist information, go to the Aegina trip maker website . Traveling by combination of taxi and ferry from Athens to Aegina takes 1.5 hours. Alternatively, you can do a combination of subway and ferry; or do a combination of bus and ferry. In April, daytime highs in Aegina are 70°F, while nighttime lows are 55°F. Wrap up your sightseeing by early afternoon on the 6th (Sat) to allow enough time to travel back home.